(L–R): Peter Achterstraat, former president of the Institute of Public Administration Australia (NSW Division), the Hon Megan Latham, ICAC Commissioner, and former NSW Ombudsman Bruce Barbour at the 2014 National Investigations Symposium. 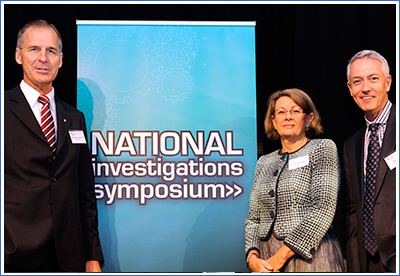 Registrations are now open for the 11th National Investigations Symposium (NIS), a biennial event that offers professional development and networking opportunities to investigators and complaint-handlers working in the public sector. The NIS will take place from 9 to 11 November at the Four Seasons Hotel, Sydney. The program features four concurrent topic streams with Australian and international guest speakers, including Travis Tygart from the US Anti-Doping Agency, and Dame Beverley Wakem, former chief ombudsman of New Zealand, who will highlight investigative techniques in difficult situations, and a plenary session facilitated by award-winning Australian journalist and author Chris Masters. Delegates can separately register for workshops on administrative law, fact-finding, interviewing techniques, report writing, and motivational interviewing. Book before 1 August 2016 and save with an early bird registration. NIS is a joint initiative of the NSW ICAC, the NSW Ombudsman and the Institute of Public Administration Australia NSW. The Corruption Prevention Network runs free lunchtime seminars in the Sydney CBD. Registration is essential but anyone can attend to learn more about a range of topics that fall under the banner of Corruption Prevention (CP) Basics. CP Basics is held from 12.30 pm to 2 pm at the Mitchell Theatre, level 1, Sydney Mechanics School of Arts, 280 Pitt Street, Sydney. The ICAC’s 2016 rural and regional outreach program was launched with a visit to the Orana and Far West region during May. Commissioner the Hon Megan Latham hosted a community leaders' lunch in Cobar, which was attended by local councillors and representatives from state government agencies, schools, businesses and community interest groups. The visit included workshops for state and local government agencies to raise awareness of corruption risks and learn ways to prevent corrupt conduct. Approximately 100 people participated in the outreach activities, which generated positive feedback. To learn more about the ICAC’s free workshops for NSW public officials, visit the website.